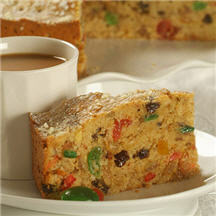 A special Christmas dessert throughout Chile, this sweet cake-like bread is laced with nuts, spices and candied fruit. It is traditionally eaten while presents are opened on Christmas day. Argentines enjoy a similar Christmas bread called pan dulce. Preheat oven to 300°F (150°C). Grease 9-inch springform pan. Line bottom with 9-inch circle of wax paper. Grease top of wax paper. Combine candied fruit, raisins, nuts and orange zest in medium bowl; set aside. Combine flour, baking powder, salt, cinnamon, anise seeds and cloves in medium bowl. Beat butter, brown sugar and granulated sugar in large mixer bowl until light and fluffy, about 1 minute. Add four eggs, one at a time, beating well after each addition. Gradually stir in flour mixture alternately with evaporated milk until blended. Stir in candied fruit mixture. Spoon into prepared springform pan. Bake for 45 minutes. Remove cake from oven. Beat remaining egg in small bowl. Brush top of cake with beaten egg and sprinkle with powdered sugar. Bake for an additional 40 to 50 minutes or until wooden pick inserted near center comes out clean. Cover cake with foil if it starts to brown too quickly. Run knife around edge of cake; remove side of springform cake. Turn cake over onto a plate; remove wax paper. Store cake tightly wrapped in plastic wrap in refrigerator for 1 day before slicing. Store refrigerated for up to 7 days.